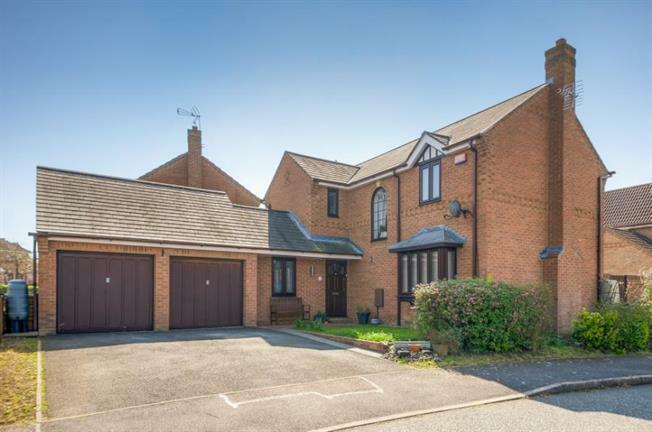 4 Bedroom Detached House For Sale in Milton Keynes for Guide Price £500,000. A beautiful four bedroom detached family home available for sale in the popular 'Old Farm Park' development of Milton Keynes. Situated within catchment for the highly regarded 'Walton High School'; and close to commuting links by road to London and Birmingham. On entering the property you are greeted to a bright entrance hall with doors leading to all rooms. The kitchen is perfect for entertaining with central island, granite worktops, butler sink and integrated appliances. The dining area is finished with real wood flooring and French doors leading to the garden. Going through to the lounge is a large bay window filling this room with light a gas fire for those cosy evenings and patio doors again leading to the garden. Upstairs are four bedrooms and a family bathroom. The master bedroom benefit's from an en- suite and built in wardrobes. The current owners use bedroom three as a walk in wardrobe but can easily be converted back to its original use. Outside is a well maintained south facing garden with patio area, lawn and part walled and fence boundary. The front has a private drive with off road parking and double garage. Positioned on a corner plot, within walking distance of local amenities and a short drive from Kingston District Centre with its array of shops and restaurants this property is perfect in location and lifestyle. The property in brief comprises: entrance hall, wc, study, kitchen/diner, utility. Lounge, four bedrooms, en-suite to master, bathroom, double garage.